Taking a big leap in the field of bilateral cooperation, India and France on Monday signed the much awaited deal for 36 Rafale Fighter jets. However, both the leaders agreed that the deal has some financial aspects yet to be discusses but expressed hope that they will be sorted out soon. 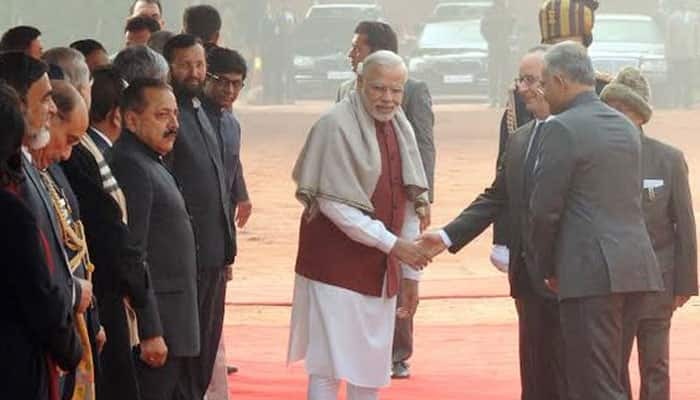 Calling the French President a close friend of India, PM Narendra Modi welcomed him for the Republic Day celebrations. "From security of borders to smart cities to solar energy to nuclear power, from Namaste to Bonjour, we have strengthened our relation," said PM Modi while addressing the media after bilateral talks at Hyderabad House in New Delhi. 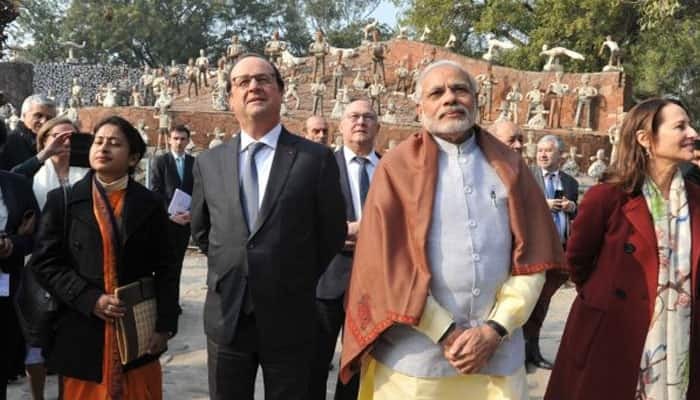 Expressing his desire to share French technology with India, Hollande said, "Rafale fighter jets is a symbol but there are so many other fields we are cooperating. From culture to defense matters we share common interests." This alliance ensures the world gets more energy and there is also a focus on innovation: PM Modi. USA, France & India...these three nations took the initiative of innovation. Lets innovate & protect the environment: PM Modi. 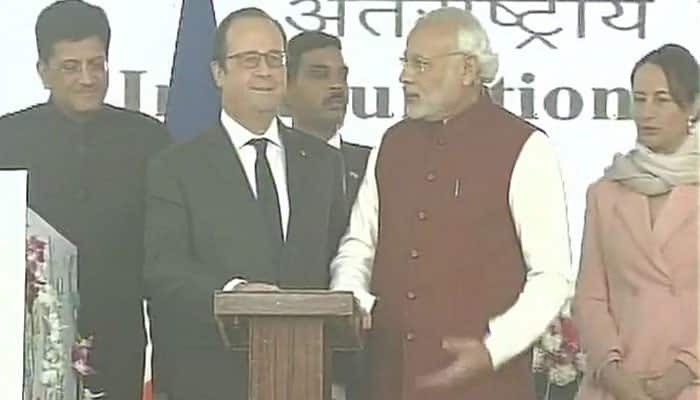 PM Narendra Modi and President Francois Hollande at interim Secretariat of International Solar Alliance (ISA). Although headquartered in India, the ISA is a global institution meant for the benefit of mankind: PM Narendra Modi. Our ancestors have taught us to love nature, we see god in a plant, this is our tradition: PM Modi. We are the people who taught the world how to love Nature, we were taught that God resides in a plants: PM Modi. Energy has become an integral part of a nation's development journey: Prime Minister Narendra Modi. World has been discussing global warming for the last one year and how to mitigate it: PM Modi. 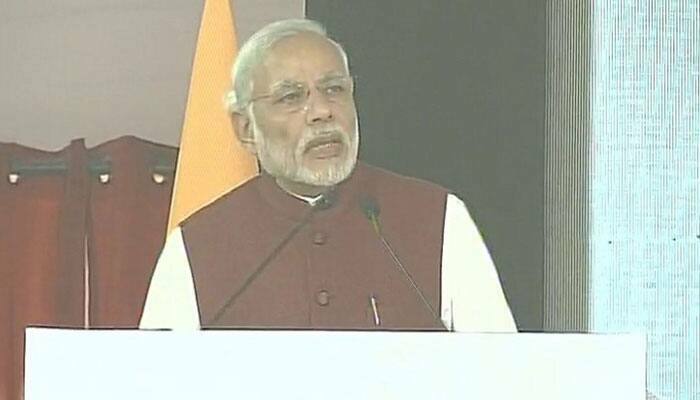 PM Narendra Modi speaking at interim Secretariat of International Solar Alliance (ISA) in Gurgaon. Today, a new chapter opens for nations to utilize the power of the sun: French President Francois Hollande. 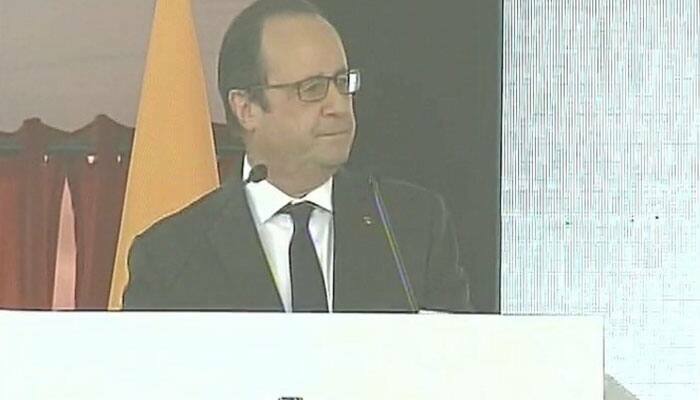 French President Francois Hollande speaking at interim Secretariat of International Solar Alliance in Gurgaon. 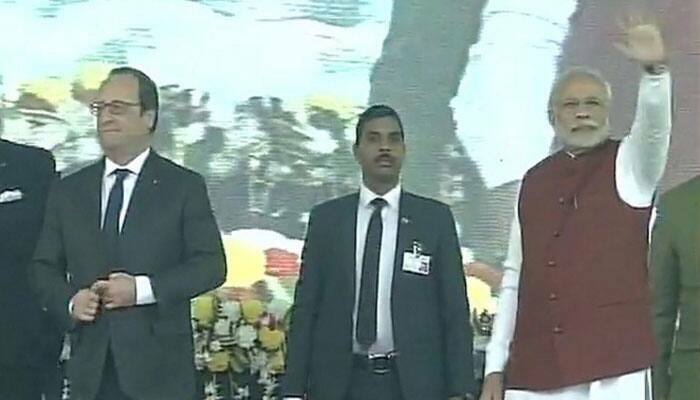 PM Modi and France President Hollande inaugurate the interim Secretariat of International Solar Alliance (ISA) in Gurgaon. 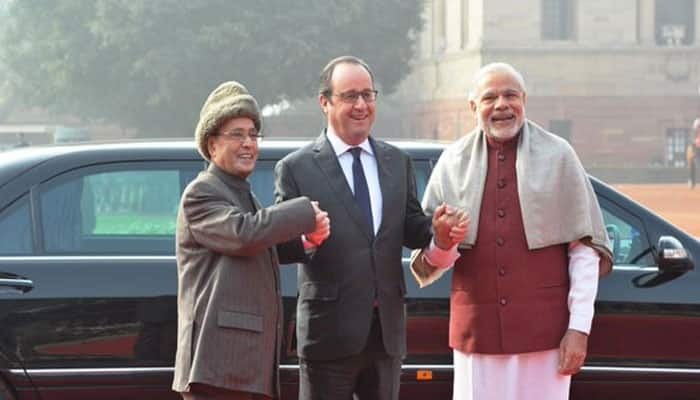 Both, PM Modi and President Hollande reaffirmed their determination to jointly combat terrorism. According to the MEA, both the leaders agreed over adoption of Comprehensive Convention on International Terrorism. "Rafale fighter jets is a symbol but there are so many other fields we are cooperating." "France and India are both aware of threats of terrorism, as both nations have been targeted recently." "We would like the French technology to be available in India, especially in Varanasi." "France would be one such country whose military troop will be marching tomorrow along our troops shoulder to shoulder. From security of borders to smart cities to solar energy to nuclear power, from Namaste to Bonjour, we have strengthened our relations. From locomotives to satellites, archeological excavations to smart cities; solar energy to nuclear power; our decisions have touched all domains." says PM Modi. "I am honoured to welcome you as our guest for the Republic Day celebrations in Delhi. France and India have a strategic partnership of 18 years. We have a partnership branching out to various fields," says PM Modi. "We are very happy that we have formed an agreement for purchase of 36 Rafale aircrafts with France," says PM Modi. "Want to encourage Indian Government to continue the reform movement it has launched. The economic presence of France in India goes back a long way, we are the third biggest foreign investor in India," says Michel Sapin, French Finance Minister. Talks between President Hollande and PM Modi underway in New Delhi. French President Francois Hollande meets PM Narendra Modi at Hyderabad House. 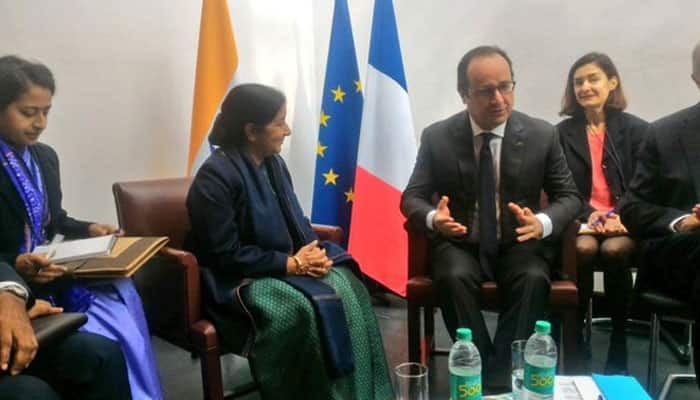 The French President meets Minister for External Affairs Sushma Swaraj. "France will not be deterred by the threat of ISIS. Our full effort is to eradicate them," says Hollande at Rashtrapati Bhavan. "Honoured to be the Chief Guest at India's Republic Day parade. Today, there are all kind of terrorist threats that are hovering around countries such as India and France and one of the main aims of my visit here is to reinforce and strengthen the cooperation against terrorism between our two countries," Hollande said after getting a ceremonial welcome at Rashtrapati Bhavan. He also said India and France will "work to improve economic relations in the field of agriculture and space". Francois Hollande gets ceremonial welcome at Rashtrapati Bhavan. 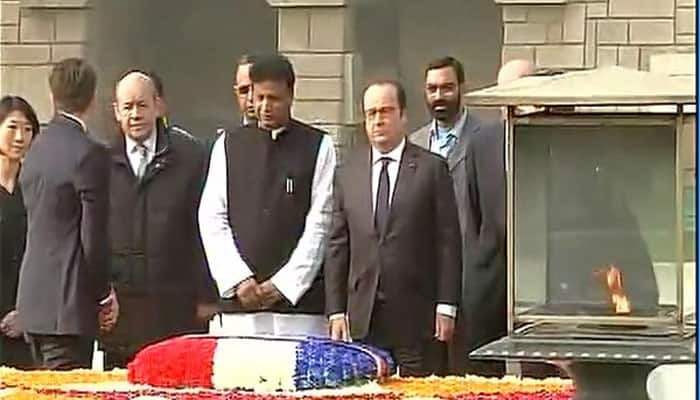 French President Francois Hollande pays tribute to Mahatma Gandhi at Rajghat. Union Minister Prakash Javadekar was also present here. PM Modi and Sushma Swaraj arrive at Rashtrapati Bhavan, where French President Hollande will be accorded official reception. "Will together further intensify exchanges, participate in inter-service cooperation and act to reinforce our military equipment," says Hollande. "They (Rafale deal talks) are progressing. The contract itself can only be signed after the inter-governmental agreement, it will be discussed. 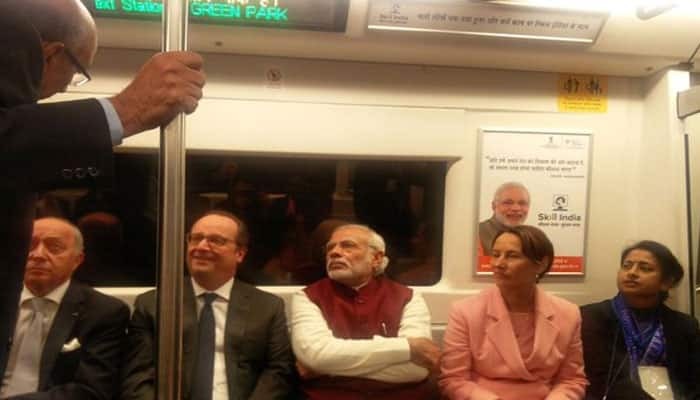 When PM Modi came to Paris, he himself announced order for 36 aircrafts,but with conditions that were to be specified," says the French President. "They are progressing," says the French President when asked about Rafale deal on day 2 of his 3-day India visit. Prime Minister Narendra Modi will hold talks today. Reports suggest that the Rs 60,000 crore Rafale jet deal is unlikely to be sealed this time. The French President on Sunday, ahead of arrival, has indicated that Rafale jet deal could take more time. "We are going to take another step on the road which we hope will lead us to India's acquisition of the 36 Rafale jets. The commercial contract can only come after the inter-governmental accord, which will be discussed during my visit." French President to get official welcome at Rashtrapati Bhavan in short while. 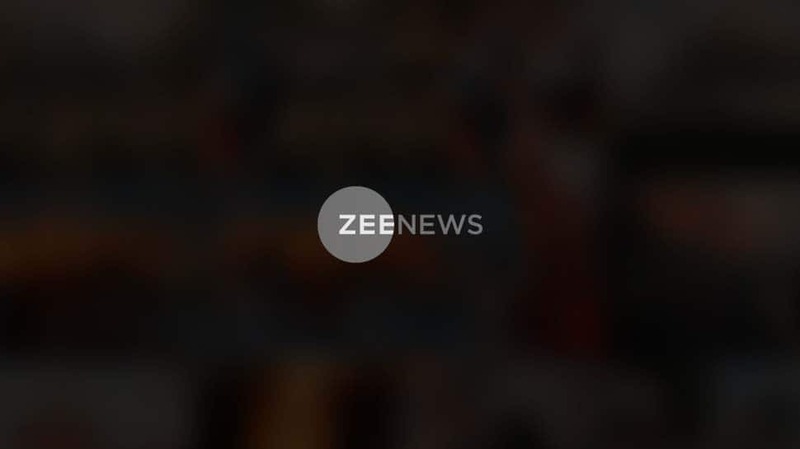 Deshhit: Will Azam Khan get votes by provoking Muslims? Deshhit: Yogi Adityanath's Hanuman pooja for votes in LS Polls?